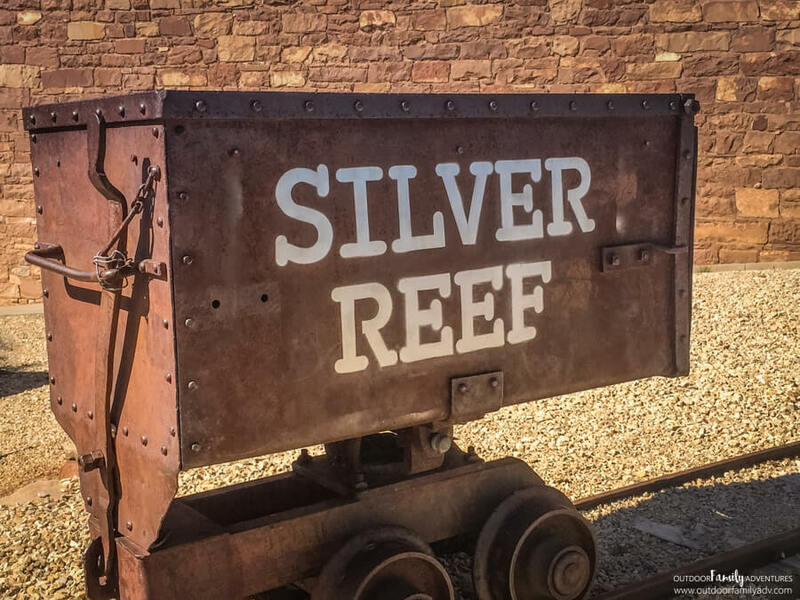 Leeds, UT was originally settled as “Silver Reef” and quickly became a silver mining town. On our family trip to see the Leeds Creek Kiln, we knew we had to stop at the museum and cemeteries on the way out of town. For directions to the Leeds Creek Kiln (used in the mining process), click here. Head north on I-15 from St. George, UT. Take exit 22 and turn left. Drive through the town of Leeds on Main Street. Turn left on Silver Reef Road. Follow the brown and white historic signs to the museum. I had no idea how much history Silver Reef and Leeds had tucked away. Make sure you take the time to read the plaques and pick up a map from near the museum entrance; this will help you understand everything you are looking at. These are remnants of a respected man in town who was known for his beautiful home and gardens. He was wealthy enough to pay for the finely shaped rock his home was built with. Any of you have Minecraft lovers? We have a few in our family. It was MORE than cool for them to see a REAL LIFE MINE CART! See kids! What you see in games is actually part of real life too! Imagine that! I love me some old wagons. Make sure you take a peek in the locals yards as you drive past their homes (peek from your car, don’t trespass, that’s not cool) — a lot of them have some old wagons and even mine carts. Very fun. Do you see the foundation remnants and piles of rocks from the working mine? Just so cool. My husband was very entertained that they just built things right on side of hills. So different than how we do things now. We also took the time to visit the cemeteries right after you travel under the freeway (to the left). There were so many unknown graves and it made me want to figure out exactly who they are. Of course, I’m sure if we don’t know now we won’t ever know. This is a great stop when you combine it with visiting the Leeds Creek Kiln. You can see most everything here for free; this trip will only cost if you choose to enter the museum. Fun tip: This is the ONLY place to discover silver in sandstone! Pretty fun! This is a piece of history; please be respectful and teach your children to be respectful, especially in the cemeteries. Museum is CLOSED Tuesday, Wednesday and Sunday.